Air masses are large bodies of air with a uniform temperature, pressure and humidity throughout. They move over large distances and the bodies of water and land they originate from affect the type of weather they bring to the places they subsequently travel over. In the UK, we are affected by 5 air masses, which originate from colder, northerly areas or warmer, southerly areas. The map and explanation above shows the direction of the air mass movement and the weather characteristics they bring with them. The names of the air masses hold clues as to where they originated (and hence the weather they will bring). TROPICAL air masses will bring warm weather and POLAR / ARCTIC will bring cold. CONTINENTAL air masses have travelled over land, and will therefore bring dry weather (as they haven't picked up much water on the way). 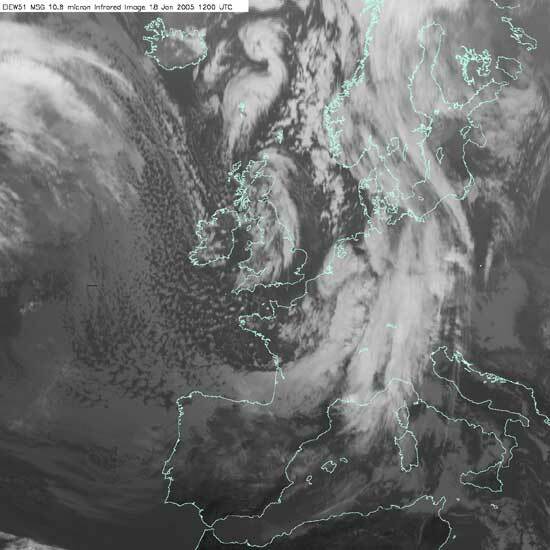 MARITIME air masses have travelled over the sea, so will bring wet weather. 1 Arctic Maritime - originating from the Arctic area, this air mass brings cold, snowy weather in winter, particularly to Northern Scotland. 2 Polar Continental - cold, dry weather all year round. The POLAR part of the name shows it has come from a northerly direction (hence cold) and the CONTINENTAL part of the name, shows it has travelled over the land and is hence a dry air mass. 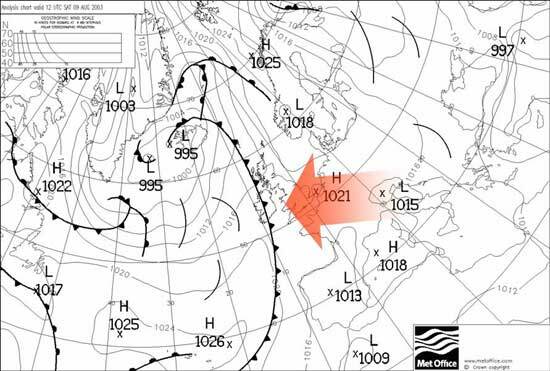 In the UK this air mass comes from Siberia and Eastern Europe before passing over the North sea to reach the UK. As it passes over the North sea it can pick up some moisture, bringing snow to the East coast in winter. 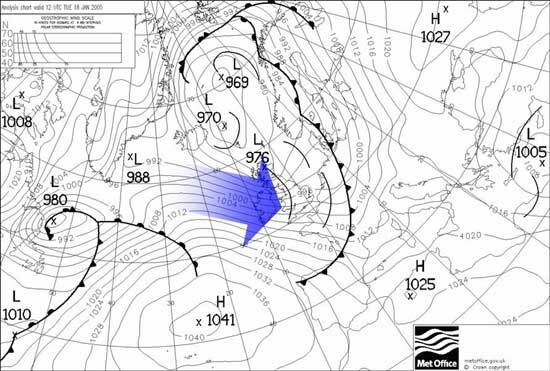 3 Polar Maritime - this air mass has travelled from the north over the sea, and hence brings cold, wet weather. It originates in Greenland and North West Canada. 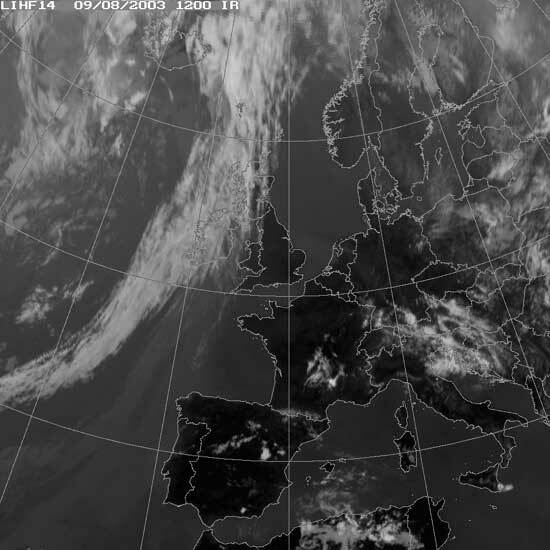 4 Tropical Continental - travelling from the south and southern Europe over land, this air mass brings warm, dry weather. This air mass can cause heat waves in the UK in summer. 5 Tropical Maritime - this air mass brings warm, wet weather, having travelled from the south West over the Atlantic Ocean. 2a) Copy the map at the top of the page and annotate the air masses with information on what weather they bring to the UK and why, and where the air mass has originated. d) Using the satellite images and weather charts below, compare the features of tropical continental and polar maritime air masses. You could look at cloud cover, surface pressure (using the isobars), types of front, direction of movement.